Kevin Rudd became Australia's 26th prime minister when the Labor Party won office, replacing the Liberal-National Party government led by John Howard. He lost the party leadership and the prime ministership to Julia Gillard in 2010, but became prime minister again after winning a leadership ballot in June 2013. Kevin Rudd attained the leadership of his party, and the prime ministership, without deep factional and personal support within the Labor Party. He came to prominence due to his passion for policy, willingness to engage in politics at both a strategic and tactical level and ability to engage with the public using a range of measures and methods. 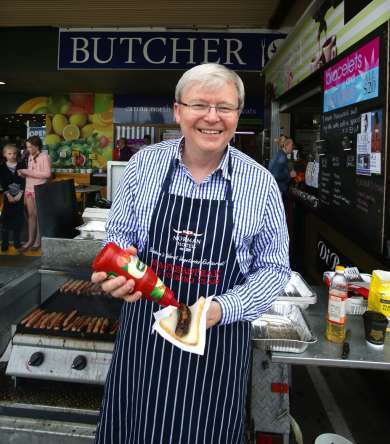 Having grown up in a rural area of Queensland, Kevin Rudd joined the Labor Party at the age of 15. After the death of his father, his family experienced significant hardship and this early experience contributed to a personal commitment to social justice. At school he was a strong debater, and began reading Hansard in his spare time. He pursued his interest in Chinese language and history at university, and became a diplomat with postings to China and Sweden. Elected to parliament in 1998 for the seat of Griffith, he soon became the Shadow Minister for Foreign Affairs and then, in 2006, Opposition Leader. He defeated the long-serving Howard Government in December 2007. He initially enjoyed very strong support as prime minister, but this declined to the point where he was replaced as leader in June 2010. After a second brief term as prime minister in 2013 he retired from parliament following the September election defeat. On his first day in office, Prime Minister Kevin Rudd signs the instrument of ratification of the Kyoto Protocol, an international treaty commiting signatories to reducing greenhouse gases. On 13 February, the Rudd Government moves a motion in Parliament to honour Indigenous peoples, reflect on past mistreatment including the removal of Aboriginal and Torres Strait Islander children from their families, and work towards a future where all Australians are truly equal. The Australia 2020 Summit is held on 19-20 April in Canberra. It brings together 1002 delegates to discuss ten 'critical areas'. Ideas and proposals were also invited from other members of the community. During an address at the United Nations on 25 September, Rudd calls for a range of reforms to financial institutions, to be developed and implemented through bodies like the Group of 20 nations. On 14 October an emergency spending plan is announced with payments totalling more than $8 billion for pensioners, families, first home buyers and training, as a response to the growing Global Financial Crisis. A $42 billion plan for measures including free ceiling insulation, school building projects, local community infrastructure and roads, payments to families and students, as well as business investment tax breaks, is announced as a further response to the severe global recession. The Fair Work Act comes into effect on 1 July 2009, replacing the earlier Work Choices legislation. The first Rudd government entered the House of Representatives with a comfortable majority, achieving the largest election swing since 1983 and winning 23 seats from the Coalition. In the Senate, the Coalition kept a majority, and the Rudd government relied on negotiations with the Greens, Family First and independent senators to pass legislation. 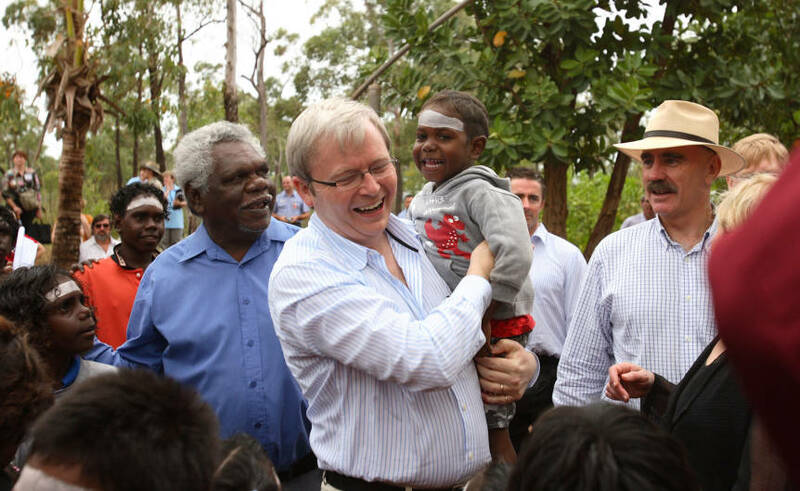 The first six months of the Rudd government were punctuated with important symbolic moments, including the ratification of the Kyoto Protocol, the Apology to the Stolen Generations and the Australia 2020 Summit. During this time, Rudd enjoyed a very high level of personal approval with the electorate, which was further bolstered by the positive response to his leadership during the Global Financial Crisis. His government began to struggle after proposing the controversial mining tax, changing their approach to climate change policy and as the consequences of rapid policymaking and implementation, including with the home insulation program, began to bite. The second Rudd government took over control of the minority government of the Gillard years. After coming to power in June, Rudd had just over five weeks to make a few changes before the parliament was dissolved and campaigning began for the September election. 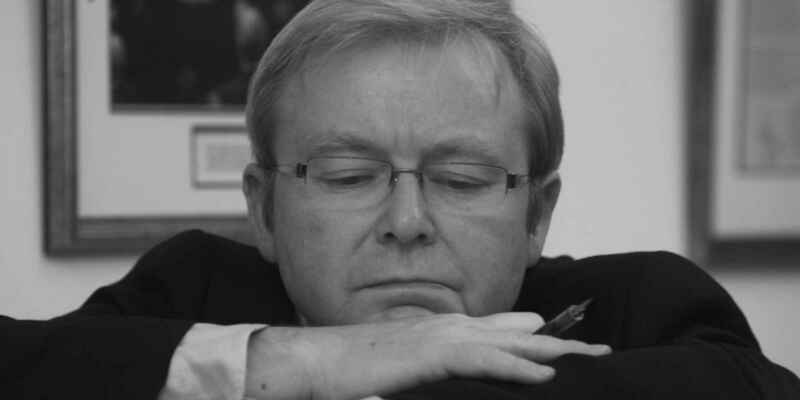 Rudd's 'Kevin '07' campaign is considered a modern textbook example of how to win an election, and the Labor Party applauded him for this victory after almost twelve years in opposition. After the 2007 victory, parliamentarians and staff soon began to feel the strain of the volume of initiatives being attempted by the Rudd government, manifested in many late nights and last minute changes. Rudd and his deputy, Julia Gillard, were known for a time as the 'dream team', but this relationship could not be sustained in light of the experience of office and a spiralling downward trajectory with the electorate. Having been defeated by Gillard in the party room, Rudd remained in parliament during the Gillard prime ministership and was widely considered to be a destablising force. By 2013, the Labor Party's position was dire, and several of those who had voted against Rudd in the 2010 leadership spill now voted for him to be reinstated, most notably Bill Shorten, who would succeed Rudd as the leader of the Labor Party after the election. Kevin Rudd was the first Australian prime minister to use emerging social media technologies for communication. During the 2007 election campaign Rudd quickly built a large following by adopting new approaches, including posting 'selfies' to engage audiences. This continued through to the lead up to 2013 election, where he posted images from his daily life, even morning shaving mishaps. Social media experts, including Catriona Pollard, have suggested that much can be learnt from the way Rudd, and other politicians, have used social media to 'build your personal brand, expand your opportunities and networks, and carve out your niche as a thought leader and expert.' She also observed that Rudd has been highly effective at using social media to engage the public in conversations and to gauge the public mood. Because constitutional change must be a part of a journey that makes all Australians proud. We must tread that path to change, together.